In the previous two chapters, you learned how to create an HTML page with some text on it. However, to make it a "real" Web page you need to connect it to the rest of the World Wide Web--or at least to your own personal or corporate "web" of pages. This chapter will show you how to create hypertext links--those underlined words that take you from one Web page to another when you click on them with your mouse. You'll also learn to create links that go to another part of the same page. Though the same HTML tag you'll learn in this chapter is also used to make graphics images into clickable links, graphical links aren't explicitly discussed here. You'll learn to create those in Chapter 9, "Putting Images on a Web Page." The more advanced technique of setting up several links from different regions of the same image is explained in Chapter 15, "Image Maps." HREF stands for Hypertext Reference and is called an attribute of the <A> tag. You'll learn more about attributes in Chapter 5, "Text Formatting and Alignment." Just A Minute: As you may know, you can leave out the http:// or http://www. at the front of any address when typing it into most Web browsers. You cannot leave that part out when you type an address into an <A HREF> link on a Web page, however. Figure 3.1 includes a number of <A> tags, which show up as underlined links in Figure 3.2. For example, clicking on the words "What happens to a Coke can if you freeze it?" 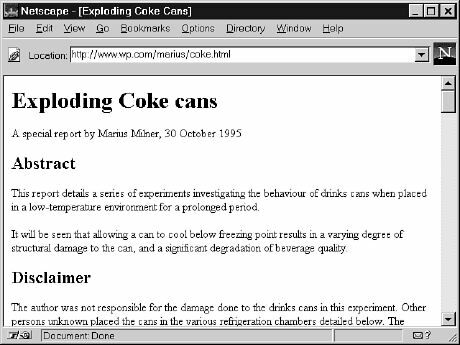 in Figure 3.2 will take you to the page located at http://www.wp.com/marius/coke.html, as shown in Figure 3.3. Figure 3.1. Words between <A> and </A> tags will become links to the addresses given in the HREF attributes. Figure 3.3. Clicking on "What happens to a Coke can if you freeze it?" 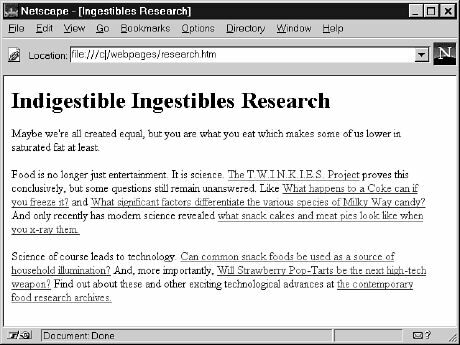 in Figure 3.2 retrieves this page from the Internet. Time Saver: You can easily transfer the address of a page from your Web browser to your own HTML page using the Windows or Mac Clipboard. Just highlight the address in the Location, Address, Bookmark Properties, or Edit Favorites box in your Web browser, and select Edit | Copy (or press Ctrl+C). Then type <A HREF=" and select Edit | Paste (Ctrl+V) in your HTML editor. Before you follow the links on that page, view the document's HTML source to see a simple example of how to put hypertext links to work. As an example, Figures 3.4 and 3.5 show a quiz page with a link to the answer page in Figure 3.6. 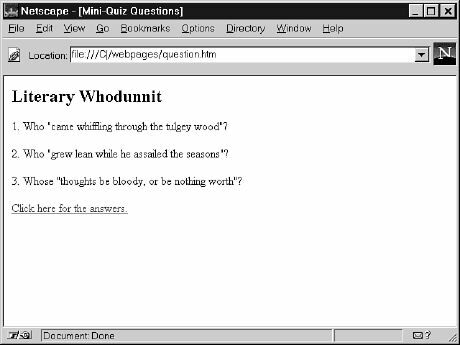 The answers page contains a link back to the quiz page. Figure 3.4. Because this page links to another page in the same directory, the filename can be used in place of a complete address. Figure 3.5. This is the answer.htm file, and Figure 3.4 is question.htm, which this page links back to. Using just filenames instead of complete Internet addresses saves you a lot of typing. And more importantly, the links between your pages will work properly no matter where the pages are located. You can test the links while the files are still right on your computer's hard drive. Then you can move them to a computer on the Internet, or to a CD-ROM or DVD disk, and all the links will still work correctly. Just A Minute: There is one good reason to sometimes use the complete address of your own pages in links. If someone saves one of your pages on his own hard drive, any links to your other pages from that page won't work unless he includes full Internet addresses. I like to include a link with the full address of my main "home" page at the bottom of every page, and use simple filenames or relative addresses in all the rest of the links. If you have many pages, you'll want to put them in more than one directory folder. In that case, you still shouldn't use the full Internet address to link between them. You can use relative addresses, which include only enough information to find one page from another. A relative address describes the path from one Web page to another, instead of a full (or "absolute") Internet address. Just A MInute: Notice that the / (forward-slash) is always used to separate directory folders in HTML. Don't use the \ (backslash) normally used in Windows and DOS! You can then move these pages to another directory folder, disk drive, or Web server without changing the links, as long as you always put african.htm inside a sub-folder named elephants. Relative addresses can span quite complex directory structures if necessary; Chapter 21, "Organizing Multiple Pages," offers more detailed advice for organizing and linking among large numbers of Web pages. To Do: You probably created a page or two of your own while working through Chapter 2, "Creating a Web Page." Now is a great time to add a few more pages and link them together. Use a home page as a main entrance and central "hub" to which all your other pages are connected. If you created a page about yourself or your business in Chapter 2, use that as your home page. You also might like to make a new page now for this purpose. On the home page, put a list of <A HREF> links to the other HTML files you've created (or plan to create soon). Be sure that the exact spelling of the filename, including any capitalization, is correct in every link. On every other page, include a link at the bottom (or top) leading back to your home page. That makes it simple and easy to navigate around your "site." Remember to use only filenames (or relative addressing) for links between your own pages, but full Internet addresses for links to other sites. The <A> tag is what makes hypertext "hyper." With it, you can create clickable links between pages, as well as links to specific anchor points on any page. When creating links to other people's pages, include the full Internet address of each page in an <A HREF> tag. For links between your own pages, include just the filenames and enough directory information to get from one page to another. Table 3.1 summarizes the two attributes of the <A> tag discussed in this chapter. Table 3.1. 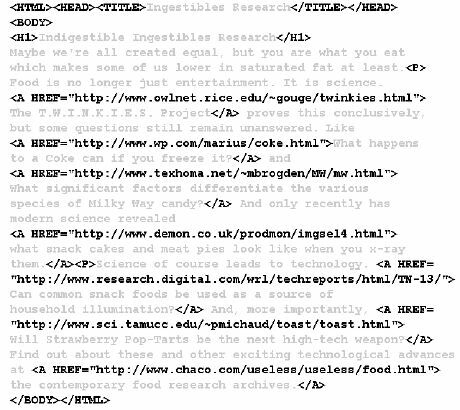 HTML tags and attributes covered in Chapter 3. <A>...</A> With the HREF attribute, creates a link to another document or anchor; with the NAME attribute, creates an anchor that can be linked to. HREF="..." The address of the document and/or anchor point to link to. NAME="..." The name for this anchor point in the document. Q When I make links, some of them are blue and some of them are purple. Why? And how come most of the links I see on the Internet aren't blue and purple? Q What happens if I link to a page on the Internet and then the person who owns that page deletes or moves it? A That depends on how that person has set up his server computer. Usually, people will see a message when they click on the link saying "Page not found" or something to that effect. They can still click the back button to go back to your page. 1. Your best friend from elementary school finds you on the Internet and says he wants to trade home page links. How do you put a link to his page at www.cheapsuits.com/~billybob/ on your page? 2. Your home page will be at http://www.mysite.com/home.htm when you put it on the Internet. Write the HTML code to go on that page so that when someone clicks on the words "All about me," they see the page located at http://www.mysite.com/mylife.htm. 3. You plan to publish a CD-ROM disc containing HTML pages. How do you create a link from a page in the \guide directory folder to the \guide\maine\katahdin.htm page? 4. How about a link from \guide\maine\katahdin.htm to the \guide\arizona \superstitions.htm page? To make a formatted list of your favorite sites, select Go To Bookmarks and then select File | Save As in Netscape Navigator. You can then open that bookmark file in any HTML editor and add other text and HTML formatting as you wish.